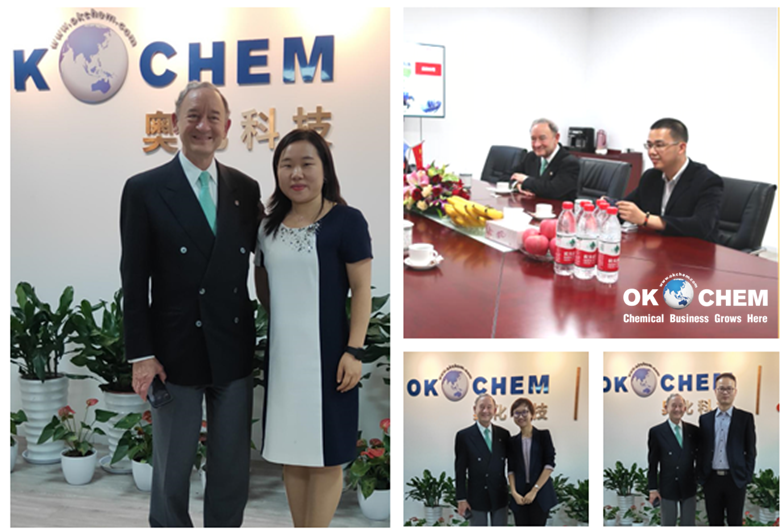 On October 17, Mr. Mark Wrighton, Chancellor of Washington University in St. Louis, and Mr. Bill Xu, Director of the China Office, visited OKCHEM headquarter office in Hangzhou. Mr. Kevin Xu, OKCHEM President and EMBA alumnus of the Washington University, and Ms. Gloria Kong, OKCHEM Vice President, warmly welcomed the two guests and had an in-depth communication with them about the development and innovations of OKCHEM, US talent training system and the future school-enterprise cooperation. After showing the two guests around our Global Research Center and the Internet Operation Dept. in Hangzhou office, Mr.Kevin, talked about our technical innovations and the company development in the recent years through the aspects of company strategy, chemical industry layout, corporate culture, talent training, etc. And Ms. Gloria further introduced our cooperation with globally renowned university and research institute. Both of the two gentlemen were impressed with the rapid development of OKCHEM. Talents are always the driving force of a company development and education plays a vital role in the talent training system. Washington University in St. Louis is a research-focusing university, and attaches great importance to the scientific research to improve its academic standing. Since its establishment in 1853, 25 Nobel Prize winners (four of them won the Nobel Prize in chemistry) have studied or engaged in the teaching and research work of the university. Mr. Mark emphasized that cultivating students' innovative thinking is far more important than imparting specific knowledge and skills. So, the U.S universities encourage students to fully display their innovative ideas and discover their potentials by providing strong funding supports to the researches. Located in St. Louis, Missouri of the United States, Washington University in St. Louis is the first and most famous Washington University in the history of the United States. The university was ranked 14th in the world in 2014 by the US News and World Report, overtaking the Cornell University, Brown University, and many other "ivy league" universities. The university has seven academic divisions: Arts & Sciences, Brown School, Olin Business School, Sam Fox School of Design & Visual Arts, School of Engineering & Applied Science, School of Law, and School of Medicine. okchem.com is a professional B2B platform for chemical business, and also a chemical supply chain with 14 overseas offices committed to providing solutions for the chemical buyers and suppliers all over the world to help them simplify the chemical trade and grow chemical business.